I am back at Verdmont! I am reminded what a beautiful house it is and what made me volunteer for the Bermuda National Trust in the first place. This week it greeted me with the sight of Christmas. 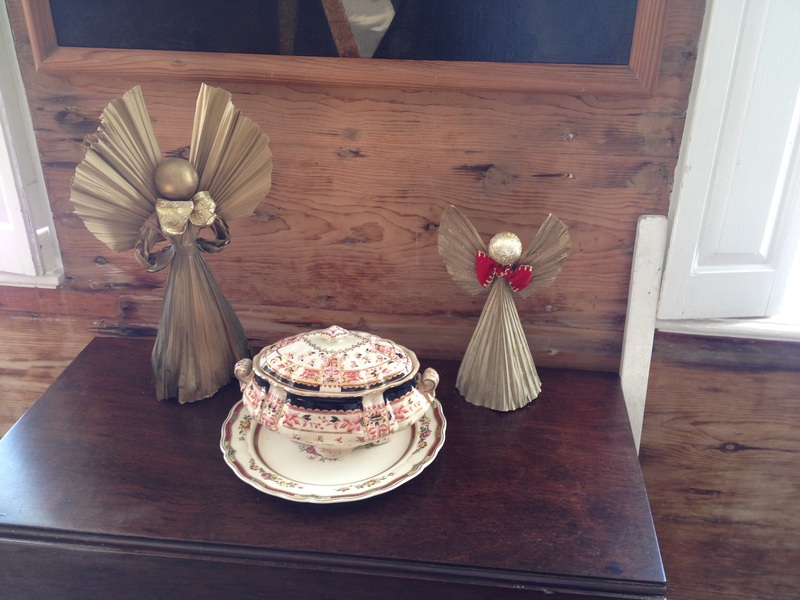 Decorations had magically appeared in every room. Thursday was quiet but not deserted, two visitors enjoyed their picnic lunch with a view across to the South Shore. The sun, less fierce now, warmed the grass and my shoulders as I read happily on the lawn. A neighbour walking her small dog and small granddaughter stopped to talk. The day moved gently with the lengthening shadows. And I closed the shutters, darkened cedar-smelling rooms fell asleep. 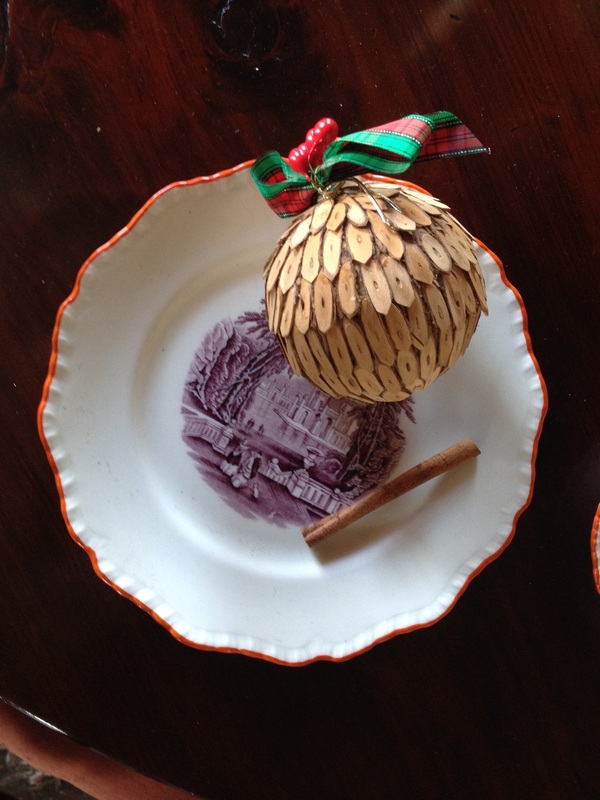 Three hundred years of Christmas. 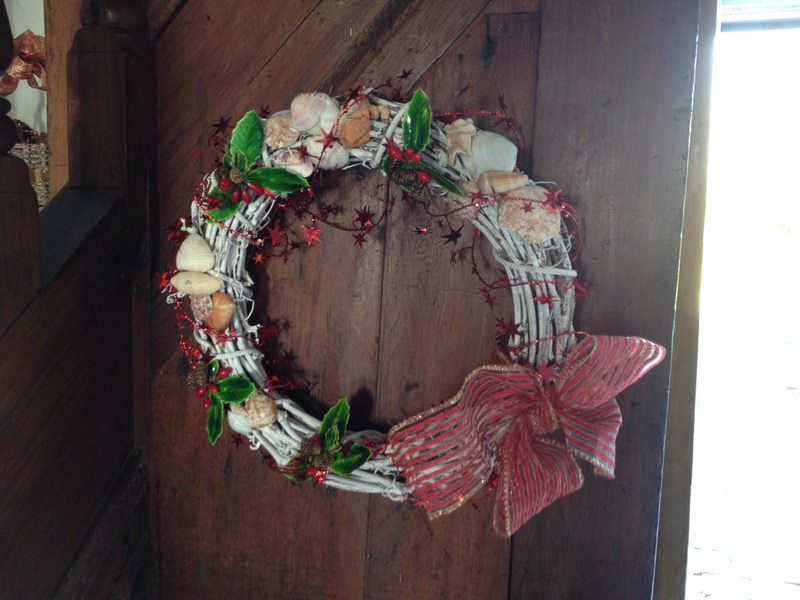 It doesn’t have to be cold and snowing to be Christmas! 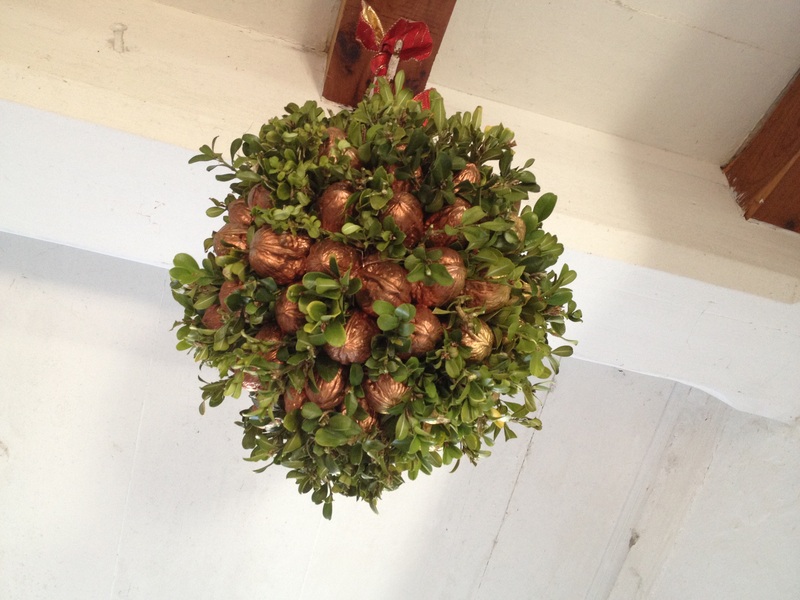 This entry was posted in Life in Bermuda and tagged Christmas, Verdmont on November 29, 2014 by KT. A Puzzle … and half an answer …. The framed print from the Library at Verdmont. Photo courtesy of Bermuda National Trust. 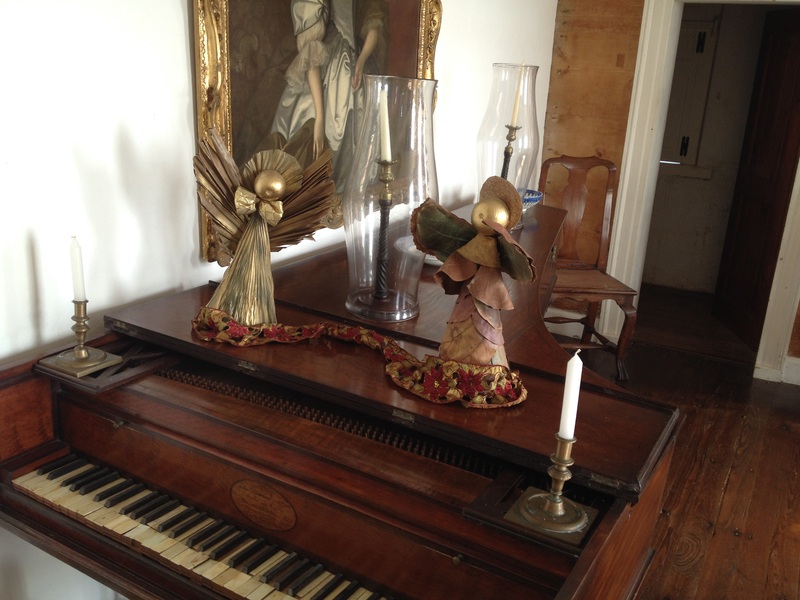 There is a green folder in each room that informs the docent or the enquiring visitor just what each item on display is and where it comes from. But with this picture I came unstuck – the description given just didn’t quite fit. And so I have been puzzling over this intermittently for a few months now, am a little closer to an answer but haven’t quite got there. I am now handing it over to .. well, to anyone who can help! 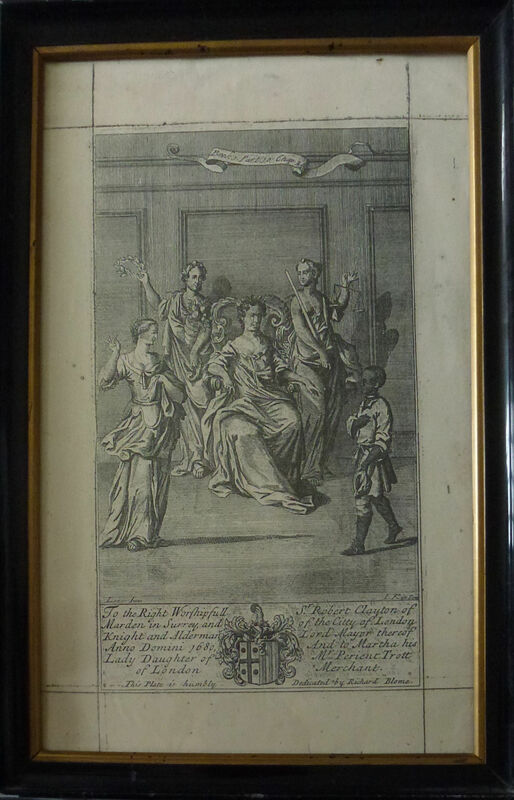 It appears to be a bookplate or similar, a print from an engraving commonly found inside books from the late 17th and 18th century. Blome was a prolific publisher of cartographic and heraldic material in the second half of the seventeenth century. He was a pioneer of the subscription method to finance his productions: by paying in advance a subscriber was rewarded by his coat of arms being placed within the work. This page was dedicated by Richard Blome to Robert Clayton. An early publication by Blome was a book of maps entitled “Brittania” which was criticised for plagiarism from similar maps by Camden and Speed. Then in 1667 he had a new series of maps engraved for “A Geographical Description of the Four Parts of the World”. These were engraved by Francis Lamb, Thomas Burnford and Wenceslaus Holler. in 1680s Blome moved away from maps and published “The Gentlemans Recreation”, part encyclopaedia and part treatise in gentlemanly sports of the day. It was printed in 1686 and contained 85 engraved plates, many of which are dedicated to specific gentlemen. “The History of the Old Testament”, another by Blome, consisted of 2 volumes with 238 engraved plates done by Johannes Kip. Could this plate be from one of these books? There IS one plate in an edition of “The Gentleman’s Recreation” dedicated to Sir Robert Clayton but the image is called “Pomona” and is of apple picking – definitely not the one I am looking for. It was common to change the dedications in subsequent editions of a publication, using the same picture but substituting the new subscribers details. Sir Robert Clayton came from a poor background but his successes in life include being instrumental in establishing deposit banks in England. 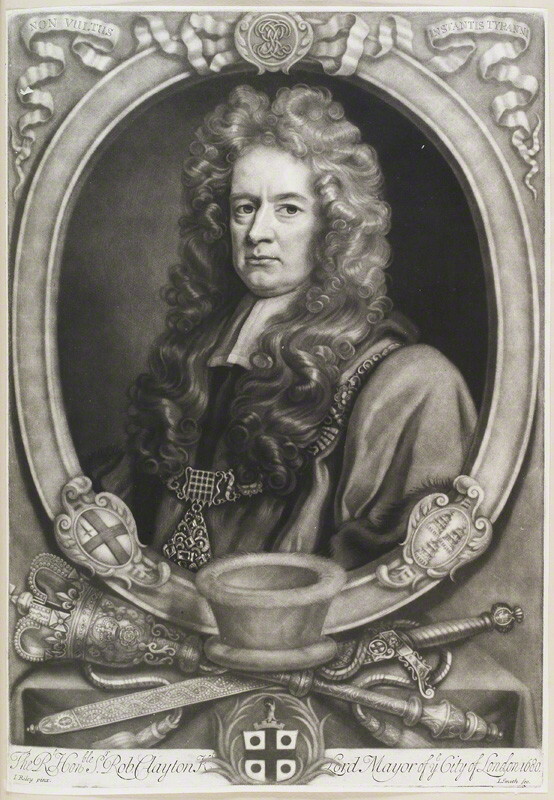 He became Lord Mayor of London in 1680 – referred to in this engraving. As Lord Mayor he was known for extravagant entertaining and his cedar dining room was reportedly decorated with classical scenes painted by an English artist Robert Streater. The facade of Clayton’s London home in the Old Jewry was the subject of engravings in 1679, copies are held in The British Museum. Clayton was also a major benefactor to St Thomas’s Hospital and Christ’s Hospital. Sir Robert Clayton by John Smith. Image courtesy of National Picture Gallery. He owned an estate, Marden, in Surrey and was MP for Bletchingley in Surrey from 1690 until his death in 1707. A monument in Bletchingley Church depicting him and his wife was erected during his lifetime and subsequently both were buried there. He married Martha Trott in 1659. She was the daughter of Perient Trott. Their wedding gift or dowry was one share of Trott’s stock in the Somer’s Island Company. They had one son who sadly died shortly after birth on 16 August 1665. At this time the Claytons fled the plague in London to stay with Robert Vyner in Middlesex. Perient Trott was a London merchant in Vine Court. His unusual first name came from his Mother’s surname “Perient”. His father was Martin Trott and mother Anne Perient. In 1658 Trott purchased 20 shares of land on Bermuda from Robert Rich, the Earl of Warwick. He never visited Bermuda himself but mixed in the circles of merchants who traded with Bermuda and further afield in South Carolina and the West Indies. But Trott was sometimes controversial – once being censured for illicit tobacco trading and another time protesting against the Bermuda Company who were restricting trading ships to the island. However, by 1671 his wealth had increased substantially and he had taken warehouses in St Botolph Without at Bishopsgate. He now owned land on Bermuda in parishes of Hamilton, Pembroke, Paget and Warwick. He had two sons, Samuel and Perient Junior, as well as his daughter Martha. Both of his sons spent some time living in Bermuda. The Christian name “Perient” was passed down through the family for several generations. Between 1726 and 1739 one Perient Trott was Speaker of the House of Assembly in Bermuda. Samuel’s son, Nicholas Trott, became a renowned 18th century judge in South Carolina. The engraving bears a coat of arms, the left side depicting the arms for Sir Robert Clayton and on the right side are the vertical stripes of the Trott family. This could be the chapter heading of the book in which the engraving sat or it could be a description of the picture itself. It is a classical drawing and there are several classical works that run to ten parts and 34 chapters but after browsing some such as Julius Caesar’s Gallic Wars and Livy’s History of Rome the text doesn’t fit the picture. Plato’s Republic has a Book 1 that deals with justice and one of the figures seems to represent Justice but, since it is not an obvious link, I am more inclined to think the banner refers to the book published by Blome. I have found similar images on an auction website, with an accompanying description suggesting they might come from “The Gentleman’s Recreation” since they are of similar size and format. One seated, three standing. The one to the left of the throne appears to be a depiction of Justice with balancing scales and a sword. Could they depict the four cardinal virtues – Prudence, Justice, Fortitude and Temperance? One is sewing, another holds a wreath and seems to have fruits on her shoulder while the seated figure has no distinguishing features apart from looking sternly at the figure of the young black boy who seems to be presenting himself, cap in hand and hand on chest. The boy has a collar around his neck perhaps indicating he is a slave although he seems well shod. At the bottom of the engraved image appear two names – one to the left and one the right side. 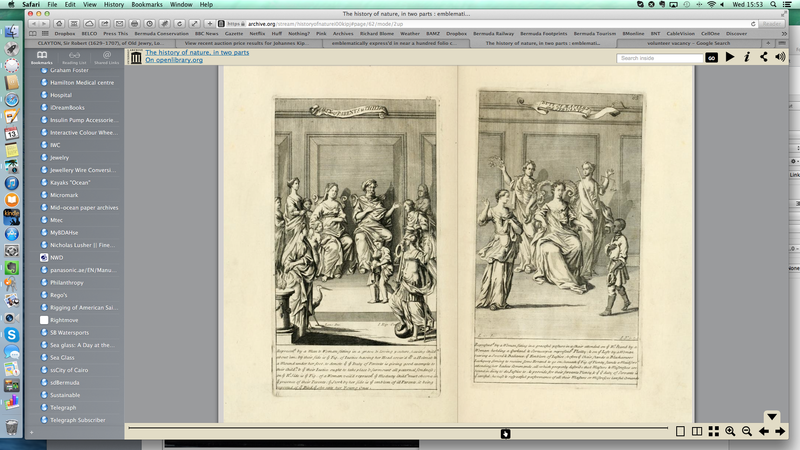 The one on the right is similar to that of Johannes Kip, a Dutch engraver who arrived in England in 1688. He was known for engravings of country mansions. The left hand signature I cannot make out. Kip sometimes did engravings after work by Leonard Knyff but although the first initial looks like an ‘L’ the second name seems to start with an ‘I’. The connection to Verdmont is through the Trott family, a descendant, Samuel Trott, owned the house from 1803, and his son after him. It is an engraving typical of those that would have decorated homes around that time period and so may actually just be representative of this, without any particular significance to the place or even to Bermuda. My search for the origin of the image has led in many directions but not yet to an answer! Not exact, but the image is the same with just the banner at the top and the dedication section that differ. Apparently published in 1720 which is after the apparent dedication date of 1680 and after the deaths of Clayton, Blome and Trott. This makes it seem that maybe this book was not the original for the image, just using it again! The picture is entitled “Duties of Masters and Servants” and the writing beneath is one possible explanation for the figures portrayed. Who drew the original picture from which Jan Kip made his engraving? In which book did the dedication to Robert Clayton appear with this image? How did the picture find its way to Verdmont? 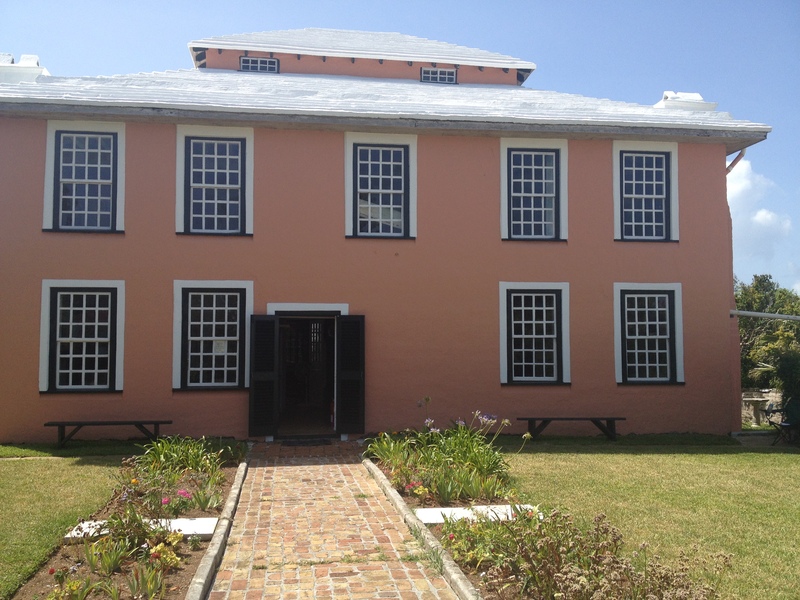 This entry was posted in Days past and tagged Bermuda National Trust, Johannes Kip, Perient Trott, Richard Blome, Sir Robert Clayton, Verdmont on August 13, 2014 by KT. Where most English would start a conversation with a comment about the weather, Bermudians, almost without exception, will start with “Good morning” Don’t the English do that too? of course, some will, but it seems less universal now than it probably was a century or so ago. The correct response to a Bermudian greeting is to repeat “Good morning!” And to look up with a smile. They often add “and how are you today?” – and seem genuinely interested in your response. This is probably the basis for the Bermudian reputation for friendliness. And (retrospectively somewhat embarrassingly) – is this lady alright? The next ten minutes saw us both herding the cat (yes, there is one) into a photogenic position in the sun. The resulting photograph was very good and I wish I had had the presence of mind to ask for a copy as a reminder. Come to think of it, I have not seen the cat again; she wouldn’t have taken it with her would she? Arriving on a Wednesday with 5000 passengers it stays until Friday when it returns to New York. In years past cruise ships came all the way into The Great Sound and moored alongside Hamilton Front Street. Now they are mostly too big. We have seen a sail-training vessel and a navy ship in Hamilton this Summer but most of the cruise ship passengers now come into Hamilton by the ferry, which, incidentally, is a really pleasant way to see the islands and to approach the city. This entry was posted in Life in Bermuda, Random and tagged Bermuda, Bermuda greeting, cat, cruise ships, Dockyard, Verdmont on October 30, 2013 by KT. Today is my second day as a National Trust docent at Verdmont. I have just opened up and am eagerly awaiting visitors. On Monday there were just two, and, despite that having no bearing whatsoever on today’s expectations, I am rather hoping for a few more. Now I am not going to bore you with the whole docent speech, but you need to know a little about Verdmont. If you are English I suspect you will have in mind some magnificent edifice – the likes of Chatsworth or Hatfield – scale it down significantly, even smaller than Sissinghurst, paint it pink ( Bermudian-salmon-pink ) and place it on a hill overlooking the south shore, add a pleasant sunny day with a gentle breeze and now you know why I chose to volunteer here specifically. Built in the final decade of the seventeenth century it is a Georgian style house, the first of its kind in Bermuda, two storeys with four rooms on each floor. Older houses were generally just one room deep, or built in a cross-like shape so this one shouts about the wealth of its owner – in this case from privateering (licensed piracy). And the reason it is special is that structurally it has been unaltered for 300 years and even though there was a lady living here until 1952, there is no plumbing or electricity and no modern gadgetry of any sort. Although I suffer from the English reticence when it comes to asking for money I managed to sell them a guide book. So now I am sitting outside in my portable camping chair (after Monday when I fidgeted between uncomfortable chair and garden bench I resolved to bring my own) drinking coffee from my thermos. The weather is just perfect, less humid than a month ago but still a bright blue sky and about 27C. There is a cockerel making a racket somewhere distant down the hill and a Kiskadee has twittered at me a few times, but that’s all I can hear – close to perfect. I will leave you to look up details of Georgian architecture – basically pleasingly symmetrical with large sash windows, in this case painted white and dark green, traditional for Bermuda windows. If you are really observant you will see in the picture that the back door is offset from the centre – this accommodates a beautiful if creaky, cedar staircase. Bermuda cedar is actually a juniper tree, native to the island, it makes for attractive golden brown furnishings of which there are some priceless examples at Verdmont. A blight in the early twentieth century has decimated the numbers of trees but there are several in the grounds here. What little I knew of furniture before coming here was garnered from Sunday evening Antique Roadshow programmes. Now I can recognize a “split-splat chair” and marching legs but not yet spot a fake Chippendale. 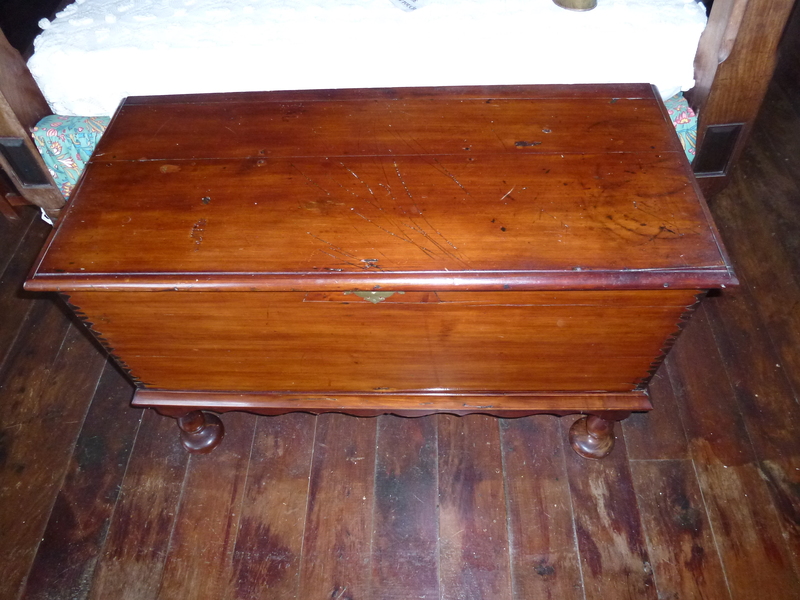 One of the visitors today (it is much later by the way, lunchtime was marked by a stream of people and no lunch), was a curator for a museum collection in Boston and he waxed lyrical about the intricacies of the dovetail joints in the cedar chests. I learnt more from him than he did from me showing him around. 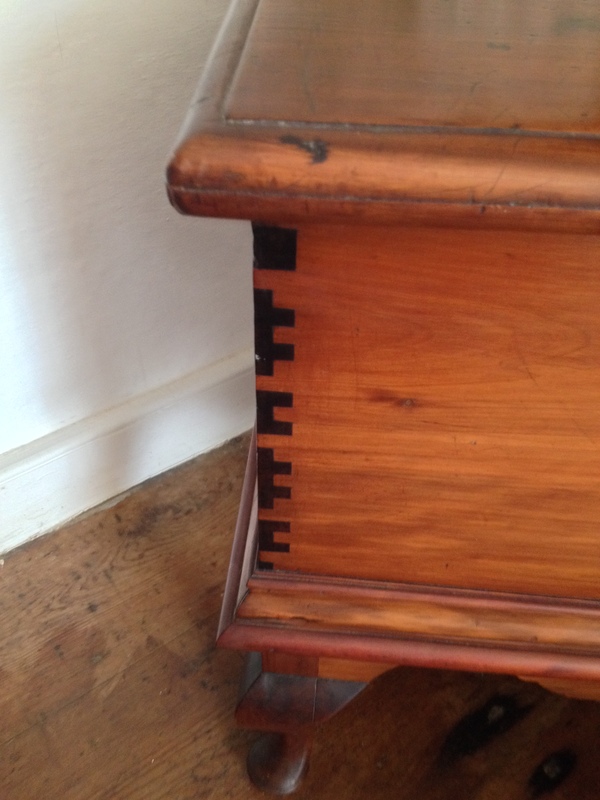 The pattern of dovetailing was used as a signature to the carpentry – I have just checked and there are at least four different patterns on the chests here. I am not sure if that was a characteristic specific to Bermuda as he said the chests in his collection were more uniform in style. Well, it is time to close up now, a process that takes forever: the windows have internal shutters which are kept in place with bolts and horizontal bars and then the sill protected by a towel to collect condensation or rain. The lack of any form of lighting makes this all feel rather creepy and although in theory I know ghosts don’t exist, I can’t help feeling a little spooked. I have brought my torch today – the solid heavy one that suggests more protection than just the light it emits. I shall post this when I get home (no Internet here of course) and tell you more about the national trust here in a later blog. 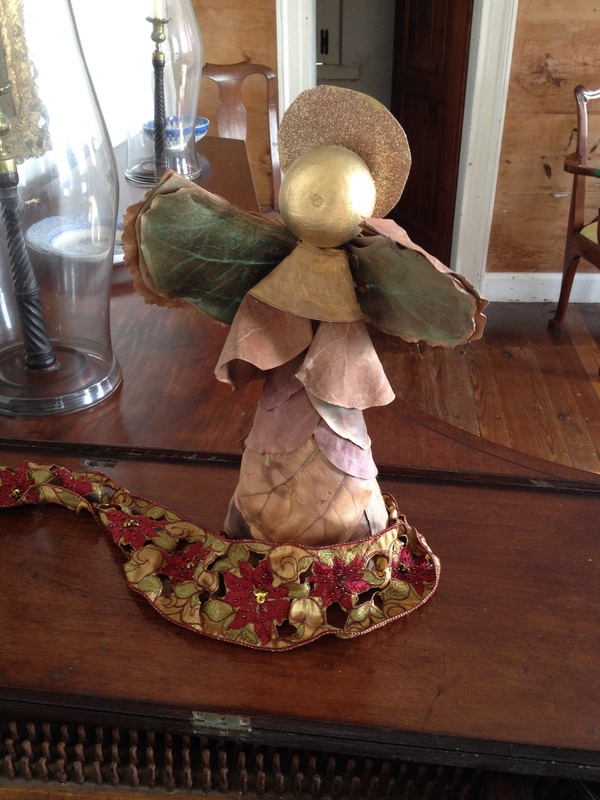 This entry was posted in Days past, Life in Bermuda, Random and tagged Bermuda, Bermuda history, docent, National Trust, Verdmont on September 26, 2013 by KT.